A while back, I was watching a morning-show when one of the guests on the show compared two very famous morning show hosts to Oprah Winfrey and called them the Oprah Winfreys of Pakistan. The next minute, I was cleaning the tea I had spilled on the table. As much as I wish with all my heart that, that statement was true but unfortunately those two morning show hosts are not even an iota of what Oprah Winfrey is all about. Pakistani morning shows are on a mission to get the entire nation married before the world ends. 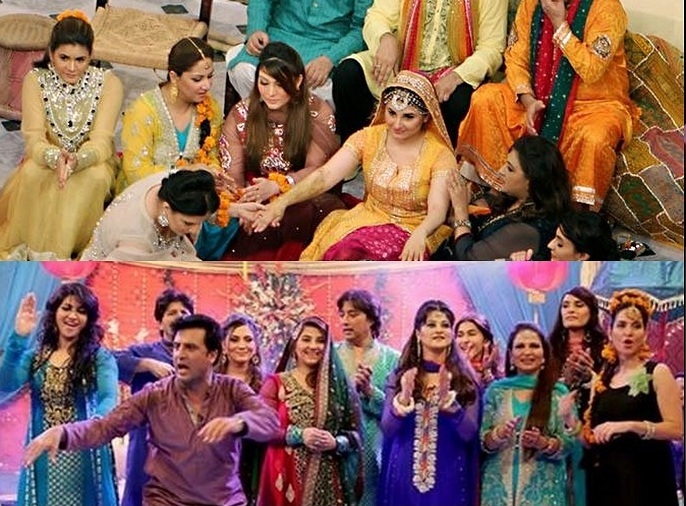 It is about time they start to do shows on contraceptives as well before the population of Pakistan has doubled due to the weddings arranged by these shows. Or wait, they cannot really dare to do a show on contraceptives because that would upset us and PEMRA. But why don’t we ever raise a voice against the extravagance showcased on these shows and why does not PEMRA ever object to the crime shows which air forced confessions of alleged criminals? For how long will we continue to pick and choose to condemn or disregard the evils? The shows portray their tactics of generating maximum revenue as a service to humanity. I have never been able to understand what joy does the couple from an under-privileged household get from watching people from the entertainment industry dance around in expensive couture. By doing all this, the morning shows are just demarcating the line between the rich and poor and making it more obvious than before. Showing the majority of Pakistanis who belong to middle, lower-middle and low classes, almost about everything they cannot afford just creates resentment. An all-time favorite segment of these shows is about supernatural creatures and spirits and black magic. The morning show hosts ooh and aah every time a different ‘Aalim‘ tries to exorcise someone by sprinkling water on them, cutting lemons, lighting candles etc. It is actually painful to watch this and frustrating at the same time to witness different ‘Babas‘ torture people when in fact all they usually need is a good psychiatrist and therapy! These shows have also really abused the concept of ‘Oprahfication’, that is, if that is what they try to imitate. While Oprah coined this term to describe public confession as a therapy and talked about various issues in her life, in our morning shows it is the other way around. The morning show hosts never talk about their failures, shortcomings, mistakes and life experiences but they invite people and cash on their misery by shedding a tear or two at their heart-breaking stories. While it has its advantages, we are still not ready for it. Inviting people to confess their secrets and discuss their personal and intimate issues on live television without a psychologist or psychiatrist being present is not only harmful but can have long term effects on the lives of these people as we are a part of an extremely judgmental society . The morning show hosts are usually very active about speaking against domestic violence and gender-issues. But those issues set aside, what do they have to say about how they let themselves and other females on the morning shows be used as eye-candy? It’s not really hard to get why majority of the morning show hosts are females. A single female host carries the weight of dozen of labels and sponsors. Clothes, shows, make up, accessories and the list goes on. The more, the merrier. These hosts constantly endorse the view that it is of utmost importance to fit in the society and for that you have to look a certain way. Whereas Oprah showed the world how a black woman with a voluptuous body can look so elegant, beautiful and charismatic only if she believes in herself. Almost every day at least one morning show has a make-up competition, which is fine but what is not okay is when the beauticians apply a foundation ten shades lighter to the model’s skin tone in order to make her look fair. This is very rare though, because most of the models chosen are fair-skinned anyway. What message are they conveying by this? The most disappointing thing about these shows is the guests who are invited. There are few guests, couples to be specific who are permanent guests. They come, they dance, and they laugh out loud, go on and on about their recent vacation in Dubai or Thailand, gossip about other celebrities, display a lot of public affection and leave. From the guests lists of these shows it almost looks like as if half of the Pakistani nation is a part of the show business and the other half is trying desperately to be a part of it. How often do we see Pakistanis who have excelled in other fields as guests on these shows? The shows endorse lawn brands but never speak up against the low wages the factory workers are paid. We are told about who wore who at the red carpet but we are never told who won the Booker or the Pulitzer prizes. Dramas and movies are reviewed and recommended but books are never talked about. Fashion designers, models, actors and singers are treated as if they are gods and goddesses with magical powers but scientists, economists, thinkers, social and human rights activists are never mentioned. Achievements of Dr. Abdu’s Salam, Prof. Atta-or-Raman, Mahbub-ul-Haq, etc. are never recognized and appreciated. They portray the Pakistani woman as a materialistic human being who has no business other than wearing designer clothes, expensive make up and brewing up facial masks in order to look at least ten years younger than her age. Why cannot the average Pakistani woman be portrayed as somebody who wants to fly a plane, be an astronaut, mountain climber or a F1 racer? The media tries to get away with all this by using the excuse that it is broadcasting what people like to watch. But that is not a legitimate excuse. Yes, people have grown accustomed to watching trash because it’s the only thing that is aired these days. However that does not mean that we Pakistanis love to watch Turkish couples somersault around on our television screens. We are a nation who loved and appreciated 50-50, Angan Terha, Dhoop Kinaray, Loose Talk. We have been shown great things, so I do not know why the media thinks that all we deserve are dubbed foreign dramas and cheesy morning shows. Amnah Mohasin is a student of Law. Really true,,,,u just portrayed my thoughts regrading the stupid shows of our media.. Sadly my mother and sisters enjoy them. I dont know why?? I don’t understand why you’re making Oprah sound like a goddess. Even she makes money through the social work she does. loved reading your thoughts on this circus of morning show……..they should ne stopped or modified to give good examples…its soooo materialistic!! They cant even come close to Oprah!! the intellect is so different!!! Nice blog, equality and justice must prevail in our society. Media at the moment regarding these kind of morning shows is like a social killer. So very true. It is so sad that females in Pakistan who could otherwise be empowering less privileged females to become educated, self- aware, independent and wise, are too caught up in making media driven portrayals of what fun it is to have weddings and only have ways of celebrating more dependence and non self reliance, by holding on to the traditions that are not essentially reflective of the true identity of females who happen to be following Islam as their faith and ideally should have a very distinct identity of being Pakistani citizens. They are all blas’ed as ever. And do not do the work of raising awareness and promoting true education that can actually make a real difference into the lives of countless females all over the country – females who get exploited for being females and being kept weak in a culture that primarily would maybe, maybe, accept power and female together, when it serves the system of female exploitation. We need more women like you, Aminah, who would persevere and show a true expose’ of the absence of needed priorities that ought to come before all else, and that bear a huge impact on the lives of all females in Pakistan. Thank you, thank you, thank you, thank you so much for this! Beautifully written. .totally agree. .
true….Media is a disease now itself!! true that …..i am so fed of these shows that i dont see them anymore…..i hate most of the female hosts …shaista wahidi being at the top of the list….because she can do something to bring the change that Pakistan need…..but its the other way round unfortunately….we are being thrown iin the darkness of ignorance by her ….being the TV host of the most popular network in Pakistan she should do some homework on her show ….she just use her good looks and she thinks that’s all that is important…..though i do miss nadia khan and i want her back in the morning show at least she had some good ideas and was way better than shaista…. I SALUTE YOU! Amazing article… This is the truth! I am an Indian (please no angry stares or comments!) and this is exactly what is happening in India too, except for “wedding shows”, we have REALITY SHOWS with no meaning at all in them! Relationship shows, breakup hookup shows.. Such disgrace! I totally love Pakistani drama, but only that which is portraying actual drama and only because they don’t drag on and on like the Indian telly shows for years! But nowadays even that is losing its essence in Pakistan. I personally avoid morning shows now. My mom is a crazy follower of Masala TV and even though it started off as the BEST food channel (I really mean it, it actually was and still is the best Asian food channel) but nowadays, its also doing way too much endorsing and that really puts me off. Come on, jewellery, lawn dresses and all being auctioned more like…(keep SMSing to win this set, this dress and the highest SMS sender will win it! WTH?!?!) … all this that too in a cooking show?! Why can’t they stick to how they were? Seriously I loved this article but sad to say …. our women and sisters like it. And i wanted to add one more thing…. Now-a-days Legal marriages are made so hard that people are not marrying anymore they find culprit ways how to get rich and have a nice women. its all so true,these shows r responsible to make our ladies more frustrated,brand concious .these shows are creating the same kind of disaster like created by STAR PLUS dramas 8 yrs back. and and and now one more thing these Turkish Dramas too. our MEDIA is pathetic . You have actually picked on everything that is wrong with this country’s media.. I think these are all attempts to create a degenerate nation! but the thing is that you can not totally blame the media.. they are buisnessmen and are selling there products, as in todays world its all about the money!! and since there are people a vast majority that follow these things its not totally medias fault.. they are just selling what people like to buy!! we have wayyyy too much time to waste on these things and media is exploiting this free time and our ignorance! An amazing writing about an issue which is as clear as sky but yet again we tend to look the other way. the only problem i see is that, we as Pakistanis have gone through an era where the only female acceptable on tv would be the one with head covered. With just not so far in the past, certain leader gave way to 180 degree turn and allowed all on TV except contraceptive…to be honest, there were ads of local brands but then suddenly they went off the screen as well. We still have a long way to go before we truly understand the power of independent and liberal media. You have talked about the morning shows, our Sehri and Iftari shows during Ramazan has even crossed the limits of being islamic at all. The audacity of the host to show the ‘world’ how we act for a cellphone or lawn ka jora (suit). Hell, Jerry Springer had more calls than Aamir Liaqat!!! a real gud article….u have actually given words to my thoughts……but i have seen one exception here….tv one …n the host is faisal qureshi…atleast…it is informative…n i havnt seen a single wedding week over there….being a busy mom n a professional, i dnt have much time to see these stupid shoows….but even then i try to spare some time to have a look on faisal’s show…. I wholeheartedly agree with the authors views. Iam thrilled that such an honest article has been printed regarding trash tv in Pakistan. Thank you. I think your blog reflects all what’s wrong with us as a society. 1. The morning shows, the self-proclaimed intellectuals, hosts looking down on people as trash, opinionated lot who portray life exactly the way a common man can not live. I am glad someone FINALLY spoke up abt it!! And the best part was that of pointing towards the feminine image these shows do cast and all those fashion snippets rather the best sellers and new arrivals in the literature section of our culture. Thank you for brilliantly exposing the reality. But this may be the part-1 that is beautifully done by Amnah Mohasin. All of us, writers, thinkers, activists etc. are now responsible to work on other two parts i-e, (1) Is this happening just for business or it is a part of a big game plan. What is behind the scene, what are the targets, where it will reach, etc. And (2) Being civilized, patriot citizen, what should we do, what should be our counter plan to save our rich culture and reasonable lifestyle. While appreciating Amnah Mohsin for a thought-provoking blog, I would also congratulate MBFC to have such an impressive writers in their portfolio. I totally agree. Morning shows are just another way to cash money by portraying misery of others. They have even made death of some family members an ‘entertainment’. It is sad but very true. One of the morning show host claimed that weddings are necessary as our nation is going through a traumatic state or they need to change the show once in a while. I just have a question, when will these morning shows ,show something different! What about those girls who are waiting for a suitor and seeing people already married getting remarried! What a waste of time. Faisal Qureshi and Farah from A tv is are doing a good job, rest are just lets be speechless. I have stopped watching Pakistani channels all together. Everything ranging from the morning shows to the evening political talk shows and turkish dramas are too boring and annoying. Finally! Finally~ someone sensible has spoken out and spoken out well! Every time I had to catch a glimpse of these Shows (while surfing) I felt like banging my head on the wall! I thought I was the only STUPID one who couldn’t really blend in and enjoy these shows. But thanks to you I know I am not ALONE! with the power these women wield they didn’t bother to do a single constructive thing even though one of the ladies is of my own profession. And how dare they compare themselves with OPRAH slathered in foundations 2 shades lighter. It’s almost blasphemous for me! Excellent piece of writing. You gave words to the thoughts of many people but the sad fact is that all of us have to stand up and speak at every level to educate people about this. People who do not have money to eat or spend on education of their children are ready to spend on useless marriage ‘riwayat’ and customs after seeing all these programs. Oprah is a woman of substance and in no way can be compared to these brainless puppets like shaista wahidi, nida pasha and others who are ready to do anything at the cost of so called entertainment. Once again – Good work! I hope that this article will serve as food for thought for other writers and will motivate them to stand against what is not right. very well said…all these aunties should know that they look not less than khusras,,,,n pathetic.. This is exactly what every educated Pakistani has been thinking. I could not said it better. I wish, though, some of the producers or these show hosts read this and try to understand. Good job girl! An extremely engaging read! Just portrays a very actual picture of our morning shows. The only complaint i have is regarding those few sentences under “About the author”. Calling the country “almost lawless” is really not the way to go. Not saying that we have the perfect law and order situation, or turning away from the reality, but the least we could do is to portray a slightly encouraging image of our state. Cheers! Very well written and true the morning shows these days is just only about the weddings like seriously what’s wrong with these people I have stopped watching tv coz whenever I turn on the tv iits some cooking show going on or these morning shows and thanks for this article good job !! Shaista just left her husband and at the same time all she talk about is shadi shadi shadi why????? is it guilt? or shes all set for her second marriage? i dont understand why shes still on tv??? and specially on GEO???? nicely written, but could’ve been better if even you’d been a lesser cheesy for Oprah n rather had given an example of any of our national legends..
Alhamdulillah I have never been cursed to have to watch these circuses. An important issue very well addressed ! Very well portrayed! My thoughts exactly! Completely agree with your blog here. I think one of the strongest reasons that nothing true is aired on these shows is because there is no freedom of speech. The other strongest reason I think is that the type of women t these shows are demonstrating do exist. These are the women who look for the fairest girls when trying to get their brother, sons etc. married. These are the women who are materialistic and disrespect anyone who is below their so called standards and status. I have only spent one year in Karachi and learned the importance of being “gori (fair)” or being rich in this country. Coming from the US, never thought about these things. It was disgusting, I can’t believe the type of people that exist in this country. Its shameful and extremely saddening. There is no respect for life in this country…its a dog-eat-dog situation. People are so judgmental, imagine having guests like Oprah brings to her shows, real people, who have real issues. Imran Khan falls from where the hell he fell from the whole nation talks about it, Abdul Sattar Edhi falls ill, only a few care to report and share about his health. Honestly some days I am ashamed to be a Pakistani, its not the country is the “parahay likhay jahil” of our country. WOnderful article! You put into to word what i always think when i watch these shows. I hope more women would think like you. Oh My God! YOU have spoken my mind! My mother watches these shows and any 2-minute part of it that I watch fills me with anger! They talk about nothing that is productive, positive or helpful to any type of progressive human being! I’m so glad there are other people out there who feel like I do; wish we could get a more knowledgeable mind (like yourself) in the media to speak about the really important things in life! its true and i really appreciate your efforts. I really don’t understand why our ladies are so much interested in these shows. THANKYOU SO much for penning all our thoughts together. You nailed it mA! This should so be published! I am sick of these promos only and the decked women and their narrow minded-ness. They need to realize there’s a world beyond makeup, clothes, impressing people and living an artificial life. hi..many of us have same kind of ideas prevailing in our minds but we hesitate to deliver… by advertising such freaky stuff these shows are making the lives of middle class families more difficult ..and specially they talk about things which they had never did or havent any valuable info on that..its good to see u throwing some light on this toppi drama..
cant agree more to this. They are a matter of shame for us. This is a well versed and a well written blog, though in some areas non matched are discussed but ofcourse Opera Humf is not all that perfect. Forgive me but aren’t we just critical and blaming one n other, not showing the realistic approach or the better way of doing these shows. Besides, some of us do need to see some glamour and fun too! and channels do need sponsors and advertisments as their oxygen. I didn’t know that they’re also about pirs & ghosts…that is just too bad…what type of culture are they inculcating in people…!!??? to believe & practice black magic, go to alims for your troubles & wish fulfilments.. rather than praying & relying on the Will of God …. hadd hay! the sad part is that our masses who are equally illiterate & *jaahil* follow them blindly. These shows should be banned forever! I am really happy that a woman talked about it because if a man would have said this, it would have all been labelled as gender bias, people who do not want woman to be happy. So true!! These shows are like a sweet pills, take the pill and loose thinking power and the sense of wrong and right. And then we all complain what is happening to our nation? I don’t know which group of people actually see these morning shows even most of the females used to sleep till late in the morning.